Throughout 2012, S+H will go beyond the annual Top 10 by presenting violations 11-30. 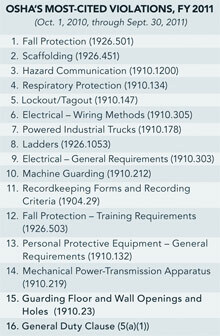 The data*, supplied by OSHA, represents violations cited in FY 2011 (Oct. 1, 2010 – Sept. 30, 2011). *The data presented does not reflect all violations cited by OSHA during fiscal year 2011. OSHA is in a transition period for implementing its new OSHA Information System from its current Integrated Management Information System. This article contains only data from IMIS. This standard covers guarding protection for openings, and goes over the specific requirements for protections such as rails, fences and other acceptable barriers. This is the general requirement for employers to provide employees with a place of employment free of recognized hazards that cause or are likely to cause death or serious harm.